I always knew that James* was different. People would say ‘He is a boy’, ‘You are on your own’, ‘It’s your first child, he will be different once he sleeps, walks, talks, goes to school etc’. but he has been ‘different’ from the beginning. James (7) is very intense, demanding, controlling and uncompromising. He is also very bright, charming and extremely sensitive. He picks up on everything but can’t process the information that he is flooded with. I have blamed myself and we have both been judged and excluded. He has never managed groups well – even at a year old banging on the door of the library during story time saying ‘out out out.’ We spent most of the first 3 years of his life in the park. James is very physically unboundaried: both with his affection and aggression. He can be violent to both adults and peers and mostly to me. I have raised him alone since he was 4 days old, and in the first two years of his life his father left our lives completely, my father became very ill and my mother died, meaning that all family structure around us was gone. I was desperate for some respite and James is very extrovert (while sabotaging most interactions) so he began mornings at nursery at 2,5 years. James was sent home for hitting another child and leaning against other children at circle time. At the next nursery, they recognised that he had sensory processing issues but he was massively overstimulated by the noise, activities and personalities of all the other children. When I would pick him up, it was as if 35 people came home with us while he tried to process everything he had absorbed. When he was 4 years old he went to a Steiner school, he just about managed 2 years of kindergarten there, mainly because of the freedom to play and the awareness about a calm environment, but as soon as formal ‘learning’ began his stress level hit the roof, which was not handled well by the school and he was asked to leave because of his behaviour. I have now decided to home-educate. Recently, James has been diagnosed with PDA (Pathological Demand Avoidance), a distinct profile of autism which is present in some people on the spectrum. This makes complete sense to me as he is alert, engaged and experiences empathy but is not able to interact. He fixates on other people and at the same time sabotages the interaction. I don’t like labels but the diagnosis felt liberating to me, it was the first time I had read about anything that seemed to describe my child and my experiences with him. From the moment I had the diagnosis, I felt I could begin living again. It doesn’t feel it has made any difference for my son, but for me, it symbolised the end of a struggle to be understood and vindicated. The struggle for acceptance with the school was one of the most dis-empowering and miserable times of my life. It took all my energy. The energy that could have been available to nourish myself and my child was spent instead of fear, despair and feeling inadequate. The point at which I first rang Simone I was utterly desperate. The violence towards me from my child was constant, and he was now getting bigger and stronger. I was actually frightened. I felt trapped and with him out of school, deeply concerned about my own mental health. All I knew was that my precious boy and I were in a tailspin. I could not abandon him, I knew what the effect of him being in the wrong environment even for a few hours a day, had on him and our life at home. He did not seem to fit into any school environment that I could find. I had to give him a chance to thrive, the only way I could see it working was at home but if I went under then we were both sunk. The initial sessions with Simone, which were sometimes confusing and challenging because I was so desperate I could hardly listen or absorb the information, were a vital part of the preparation for the change in awareness we were about to make. I liked the clarity of the theories and the simplicity of the strategies. There was no dogma or judgment and Simone’s kindness and self-awareness helped me to feel safe and understood. The 4-7-8 breathing and the PowerBook helped me to get some space between myself and the situation we were in and I prayed that the camp might help. Nothing could have prepared me for the transformation that took place at the PowerWood summer Camp. I realised as I drove home that our life would be different from then on. I felt hope and optimism and it has carried me ever since. An internal shift has taken place. I found it a very intense experience, it felt a bit like putting my child in boiling water and asking him to swim. Even in the extremely supportive environment, I felt very exposed and there were triggers for him left, right and centre. The days went on and on, I couldn’t prevent the issues or help him rebalance after them, I found it so hard. However, it was also the first time in 7 years that people were stepping towards me instead of away from me, help was offered in a practical, non-judgemental way and it was the first time I felt supported since James was born. There were others to willingly and smilingly help when things got physical. James saw his mum supported in a non-confrontational way. Simone sees to the core of each child and each family dynamic in an astonishing way. She holds the space for everyone to feel safe, seen, listened to and respected. The combination of the workshops and the real dynamic actually playing out while at the camp is very revealing. I saw through a real and painful experience, the Involuntary Mechanism that I fall into when my son hurts me or others. I had never seen it so clearly before and it felt like a light bulb switching on. I could actually see my stress response at work while neither I nor my son was judged or further stressed so that there was the space to absorb it and understand something very profoundly without getting into the story and the noise around it. James and I were both noticing other family dynamics too and after the Camp, we have referred to examples which have served as a template for us. An example of a shift in my thinking was around the bedtimes at camp. I know that James needs a lot of sleep. When I saw him playing after supper with other children, being part of a longed-for tribe I dreaded the moment when I had to tell him it was time for bed. I knew he would attack me or another and sap the last shreds of my energy. My negative thought pattern of guilt about his lack of family and siblings meant that I was always trying to compensate. Simone helped empower me to actually act confidently on my instincts rather than ignore them and I feel I had to give in to the demands of an exhausted and stressed child who could not regulate himself. It helped us break a much wider pattern not just about difficult transitions but about my trust in myself. I can see that James responds much more to my self-doubt and fear than to the fact that he has to do something he does not want to. Since the camp just 6 weeks ago, James has begun in small ways to self-soothe and regulate himself in stressful situations. He has also begun to respond to carefully timed reflection on what went wrong. He still has meltdowns, but in between things can be on a calm level rather than the top of the chart. This may change if something happens to affect my Baseline in a big way, but even if it does I will understand what is happening and rather than reacting and take steps to feed both his Baseline and my own so that we can be resilient and not fall down the rabbit hole again. I feel empowered again, I no longer feel I have to please him, I am enough. James will not end up in prison. Working with Simone has given me the confidence to be alone with my son. I have felt that many of the mainstream strategies for PDA seem to create a co-dependent relationship, born out of desperate parents trying not to antagonise an overwhelmed child. 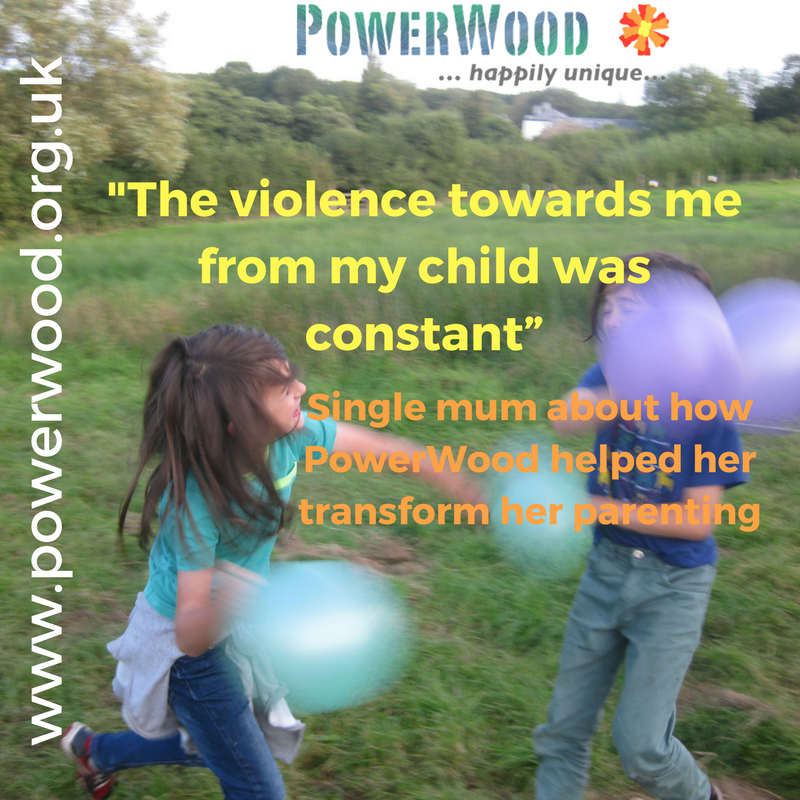 While some of them have their place, PowerWood has shown me the difference between a co-dependent stress response and a flexible, boundaried effort not to punish or shame your child for their challenging behaviour. I will not fawn, I will practice self-regulation. Even if it is hard, with PowerWood’s support I will do it. Even though I have tried to shut out the judgement of others. The harshest judge is in my own head. It is a hallmark of emotional OE to take responsibility for others and I realise that I was taking total responsibility for the difficulties my child was experiencing. I felt completely to blame and that the answers had to come from me too. That somewhere there was something I could DO to make it all stop. There actually was something I could do but it was through inaction, de-escalation, breathing, standing still and waiting – all while watching but not acting on the maelstrom of stress responses and Involuntary Mechanisms raging inside me. It will take time to really do this but Simone models this and teaches me to take a step back, to redefine my own boundaries and step further into the role of an adult who loves and guides but is separate and safe. This will be the work of a lifetime, but nothing feels more important.